Thai Lion Air plans to double the size of its fleet over the next 16 months, giving it a potentially larger operation than long established Nok Air by the end 2016. Thai Lion launched operations at the end of 2013, has already captured more than a 20% share of Thailand’s fast-growing domestic LCC market and should see its share exceed 30% by the end of 2016. Thai Lion currently operates 13 737-900ERs and recently took delivery of its first two 737-800s, which it will use to launch services to secondary domestic airports that cannot accommodate 737-900ERs. Thai Lion plans to take five more 737-800s by the end of 2015 and add 10 aircraft, a mix of -800s and -900ERs, in 2016. Thai Lion’s domestic network will grow from 10 to 13 destinations over the next few months. The carrier also resumed international services on 15-Aug-2015 with a daily flight to Singapore and plans to launch several destinations in China by the end of 2015. Thai Lion Air currently serves nine domestic and one international destination with a fleet of 13 215-seat 737-900ERs and two 189-seat 737-800s in single class configuration. Thai Lion executives stated at a 15-Aug-2015 launch event in Singapore that the carrier plans to begin serving its 10th domestic destination, Nakhon Si Thammarat, in Sep-2015. Two more domestic destinations, Khon Kaen and Trang, are planned for Oct-2015. 737-800s will be used to operate the three new routes from Thai Lion’s Bangkok Don Mueang base. Thai Lion executives told CAPA the newly delivered 737-800s open up Nakhon Si Thammarat, Khon Kaen and potentially other new destinations which have runways that are too short for 737-900ERs. One of the 737-800s also has been used to open a new base at Ubon Ratchathani, enabling Thai Lion to add a new early morning departure and increase its presence on the Bangkok-Ubon Ratchathani route from three to four daily flights. The new 737-800s will also be used to launch new point to point routes. Thai Lion currently only operates one route that bypasses Bangkok, a four times per week Hat Yai-Udon Thani service which is being transitioned to the 737-800. Thai Lion is now looking at other point to point routes for its 737-800 fleet including Chiang Mai to Krabi and Surat Thani. The Thai government requires all domestic carriers to allocate a portion of its capacity to under-served routes which have no services at all or only have operations by one other carrier. The addition of Nakhon Si Thammarat, Khon Kaen and Trang will give Thai Lion service on all 11 of the largest domestic routes from Bangkok Don Mueang, based on current seat capacity data. Don Mueang is also the hub for Thailand’s two longstanding short-haul LCCs, Nok Air and Thai AirAsia. Nok and Thai AirAsia both commenced operations in 2004. Nok and Thai AirAsia operate all 11 of Thai Lion’s initial domestic routes from Don Mueang, providing 59 and 60 daily flights respectively across these 11 routes (see table below). Thai Lion will operate about 50 daily flights across these 11 routes in Nov-2015 but provide a similar amount of seat capacity as Thai Lion mainly uses larger gauge aircraft. Thai Lion will have approximately 150,000 weekly seats across these 11 markets in Nov-2015, making it almost as large AirAsia and Nok. It currently has about 109,000 weekly seats in the eight domestic routes it now serves from Don Mueang. Thai Lion has not begun ticket sales or set an initial schedule for Nakhon Si Thammarat, Khon Kaen and Trang. But it will likely serve these routes initially with two or three daily flights, generating about 20,000 additional weekly seats. Thai Lion will likely generate about another 20,000 additional seats from capacity increases across its existing domestic network. Thai Lion executives told CAPA that more flights on Bangkok-Chiang Mai is planned to meet robust demand and that the carrier has secured additional slots at Phuket enabling it to increase Bangkok-Phuket to four daily flights by the end of Oct-2015. Thai Lion is also planning to add capacity on some of its other existing domestic routes but has not yet finalised its schedule for the northern winter season. Across its existing eight routes from Don Mueang Thai Lion now only has about 15,000 fewer weekly seats than Nok or Thai AirAsia. But when excluding Phuket, Thai Lion has about 15,000 weekly seats more than Thai AirAsia on the other seven routes. Thai Lion has so far been limited to two daily flights to Phuket due to slot constraints while Thai AirAsia operates 14 daily flights between Bangkok and Phuket. Thai Lion is planning even further expansion for the last two months of the year. The LCC expects it will operate at least 60 daily return flights by the end of 2015, which would give it approximately 170,000 weekly seats. Most of the additional capacity will be allocated to the domestic market, raising Thai Lion’s share of total domestic LCC capacity to about 26% – even after factoring in expected capacity increases from Nok and Thai AirAsia. Thai Lion currently has about a 21% share of total LCC capacity in the Thai domestic market. Thai AirAsia has about a 40% share followed by a 39% share for Nok. Thailand’s domestic market is also served by three full-service airlines – Thai Airways, Thai Smile and Bangkok Airways – as well as leisure and regional carriers. But all the growth in recent years has been driven by LCCs, which now account for almost 70% of the total domestic market. Thailand’s domestic market has seen rapid growth for several years but the rate of growth has accelerated significantly since the launch of Thai Lion Air in late 2013. As CAPA previously highlighted, domestic LCC passenger traffic at Don Mueang increased by 38% in 2014 to 15.2 million passengers and by another 41% in 1H2015 to 9.8 million. Passenger traffic data for the entire Thai market is not available but almost all the LCC expansion been focused on Don Mueang. Nok currently allocates 99% of its domestic capacity to Don Mueang as it has only one point to point route, a daily service from Chiang Mai to Udon Thani. Thai Lion also allocates 99% of its domestic capacity to Don Mueang as Hat Yai-Udon Thani is its only point to point route. Thai AirAsia has about 90% of its domestic capacity concentrated on Don Mueang as it has six daily flights across three point to point routes. Thai Lion’s rapid expansion since late 2013 has stimulated rapid growth of the domestic market as its low fares have persuaded more Thais to trade in bus and train journeys for domestic flights. But the growth has come at the expense of yields and profitability. Nok, which is almost entirely a domestic operator, saw its average passenger yield drop by 13% in 2014 and by another 11% in 1H2015. Nok incurred a net loss in 2014 of THB666 million (USD21 million), marking its first annual loss since 2008. Nok has remained unprofitable so far in 2015, reporting a net loss of THB623 million (USD19 million) for 1H2015. Thai AirAsia has been relatively less impacted as it allocates about 40% of its capacity to the international market. But Thai AirAsia saw its average fare drop by 8% in 2014 as the airline turned a net profit of only THB345 million (USD11 million), its smallest profit by a wide margin in six years. Thai AirAsia turned a THB1.297 billion (USD39) million profit in 1H2015 as its average fare increased by 2% but this was driven entirely by an improvement in international market conditions. Thai AirAsia does not provide a domestic/international breakdown but has stated the domestic market remains intensely competitive and challenging. Thai Lion has aggressively competed in every route it has entered, pushing down fares. Thai Lion’s one-way domestic fares start at THB345 (USD10) to THB545 (USD15). But it is Thai Lion’s every day fares and simplistic revenue management that has drawn criticism of competitors, particularly Nok. Thai Lion’s highest one-way domestic fare including taxes is currently between THB895 (USD25) and THB1295 (USD36) with the exception of Hat Yai-Udon Thani, which is much longer than any of its Bangkok routes and has a highest fare of THB1995 (USD56). Thai Lion has no plans to change its pricing strategy. 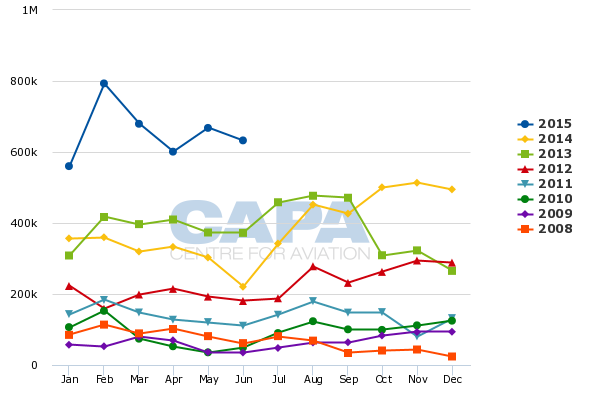 The airline believes it is best to focus on load factors, which have been consistently in the 90% range. A continuation of the current pricing environment is obviously a major concern for Nok and Thai AirAsia. Competition between Thai Lion and the two incumbents will intensify even further in the coming months as Thai Lion continues to add domestic capacity and launch three new routes. While Nok and Thai AirAsia will still operate several routes that do not overlap with Thai Lion, the portion of their capacity which is exposed to Thai Lion competition will increase. Currently Nok allocates 77% of total domestic capacity to the 11 routes Thai Lion will be operating by Nov-2015 (and about 74% of its system-wide capacity). Thai AirAsia allocates about 72% of its domestic capacity to these markets (and about 44% of its system-wide capacity). It is unlikely the level of competition will ease in 2016. There is still room for Thai Lion to continue to build out its domestic network and further grow its market share. Even after the three new routes are launched Thai AirAsia will still have eight destinations not yet served by Thai Lion. Seven of these are also served by Nok, making them obvious candidates for Thai Lion. Nok has five exclusive domestic destinations that are unlikely to see competition as they are very small markets that are only served with turboprop aircraft. But all the remaining potential domestic destinations for Thai Lion are relatively small. While Thai Lion will almost certainly begin serving a few of these destinations in 2016 it will likely continue to allocate most of its additional capacity to the trunk routes, further intensifying competition in the main markets. Thai Lion could potentially increase its share of the domestic LCC market to 33% by the end of 2016, equalling the shares of Nok and Thai AirAsia. Capturing a third of Thailand’s domestic LCC market in only three years would be a remarkable achievement but plausible given Thai Lion’s fleet plan. Thai Lion executives say the carrier is slated to add five more 737-800s by the end of 2015 and 10 additional aircraft are planned for 2016 – a yet to be determined mix of 737-800s and 737-900ERs. This would give Thai Lion a fleet of 30 aircraft at the end of 2015. Nok’s current fleet plan envisions 32 aircraft by the end of 2016. But this includes 10 turboprops and 22 737-800s, resulting in a total seat count of 4,978. Thai Lion’s planned fleet of 30 aircraft would provide 6,318 seats (assuming an even mix of five 737-800 and five 737-900ER deliveries in 2016), making it 27% larger than Nok. Even if Thai Lion ends up taking only 737-800s in 2016 it will have a total seat count of 6,008. Thai AirAsia will still be the largest LCC as its fleet plan envisions 50 A320s at the end 2016, giving it 9,000 total seats. But in the domestic market Thai Lion could potentially overtake Thai AirAsia by the end of 2016 as Thai AirAsia has a significant and faster growing international operation. Thai AirAsia plans to add five aircraft in 2016 but allocate 70% of additional capacity to the international market, where competition is less intense. As CAPA recently highlighted, Nok is also planning to expand its limited international operation in 4Q2015 and 2016. But Nok also aims to continue growing its domestic operation in response to Thai Lion’s continued domestic expansion. Nok and Thai AirAsia have both accelerated domestic expansion since Thai Lion’s launch in Dec-2013. Nok domestic passenger traffic increased by 26% in 2014 and by 28% in 1H2015. Thai AirAsia’s domestic passenger traffic increased by 17% and by 22% in 1H2015. Nok and Thai AirAsia each carried 7.4 million domestic passengers in 2014 and are aiming to carry 9 million domestic passengers in 2015. Thai Lion stated it carried 1.8 million passengers in 2014 and expects to carry 2.5 million passengers in 2015. Thailand’s domestic LCC sector will carry over 20 million passengers in 2015, compared to 16.6 million in 2014 and only 9.1 million in 2012. Can the current level of competition be sustained? It will be difficult to sustain the remarkable growth rate of the last two years. Fares and yields will inevitably have to increase, impacting demand. Nok CEO Pate Sarasin has particularly been vocal in questioning the sustainability of its new competitor. Thai Lion executives acknowledge the carrier is not yet profitable but points out it is still in the start-up phase. Thai Lion aims to break-even three years from its launch, which suggests a potentially more rational approach to capacity and pricing will be implemented from 2017. But Thai Lion is also confident it can maintain low fares by having the lowest unit costs among Thai carriers. Most of Thai Lion’s fleet consists of 215-seat 737-900ERs, giving it a potential CASK advantage over competitors using smaller gauge aircraft. Costs should decrease over the next year even with smaller 737-800s being added as Thai Lion builds up scale and improves utilisation. Thai Lion is currently only utilising its fleet an average of seven to eight hours per day. Utilisation rates are expected to increase significantly – as high as 12 to 13 hours. International flights will help drive up utilisation but Thai Lion also expects to improve the efficiency of its domestic operation. Thai Lion currently has only about 3,000 international seats as it operates just the one international flight from Bangkok to Singapore, which it launched on 15-Aug-2015. But Thai Lion plans to launch services in 4Q2015 to China, which would become its second international destination after Singapore. Thai Lion is currently in the final stages of securing approval from Chinese authorities for scheduled services. It also plans to complete the process of securing IOSA certification in Sep-2015. IOSA certification is not required by China or other authorities but makes it easier to secure approvals, pursue partnerships with foreign carriers and attract corporate passengers. Thai Lion is keen to tap into the rapidly growing Thailand-China market and serve multiple destinations in China, starting with Bangkok to Guangzhou, Chongqing and Chengdu. Thailand recorded 107% growth in visitor numbers from China in 1H2015 to 3.9 million. As it expands internationally Thai Lion will have to work on raising brand awareness overseas as the carrier is not known outside of its home market. But Thai Lion should be able to rely heavily on travel agents, particularly for the China market. Thai Lion’s local partner and chief executive comes from a travel agent background as does Lion Group’s founder and owner Rusdi Kirana. Thai Lion will have opportunities to further grow its international operation in 2016 as it adds another 10 aircraft. Further expansion in China is expected, particularly if the Thailand-China market continues to grow rapidly. Thai Lion Air also aims to start serving in 2016 other Southeast Asian markets including Vietnam and Myanmar. It does not intend to resume services to Indonesia or Malaysia, both of which were dropped in 2014. Malaysian sister carrier Malindo has taken over the Kuala Lumpur-Bangkok route while Indonesian sister carrier Lion Air is planning to launch Jakarta-Bangkok by the end of 2015. But it is Thai Lion’s rapid domestic expansion which will continue to capture the attention of Thailand’s dynamic airline sector. Thai Lion should be able to operate several routes to China but will have a relatively small share given the huge size and rapid growth in the Thailand-China market. It will also likely end up with a relatively small share of the highly competitive regional international market within Southeast Asia. As is the case with its Indonesian sister, Thai Lion may end up becoming primarily a domestic operator. Thai Lion has quickly captured a large share of Thailand’s domestic market and is keen to further build on this strength. The intense domestic competition is not about to ease anytime soon. Nok and Thai AirAsia may have to come to grips with sharing the market equally with a third player.